A charming full colour red Early Reader from BLUE PETER BOOK AWARD-winning author, Lauren St John. Mercy helped Clara and Clara helped Mercy.The story tells that if we are kind to nature , nature will be kind to us. I thought this was a great reading book. I really enjoyed it. I learnt about the importance of water for animals and plants to be able to live. I like this book so much. and I like drawing's in this book. 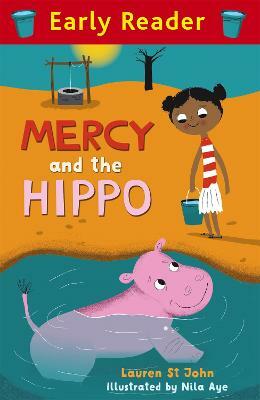 I like Mercy and the hippo because it teaches children to not be cruel to animals. And if you treat animals respectfully good things will happen to you. its about a girl who was kind to nature. It tells you to look after animals and be nice to them. It was really good. Mercy and her little brother Zane went to the well and brought two buckets of water for Clara the hippo and one bucket for them. One day the villagers took all of Clara's water. Then the next day there was a storm and the villagers said Clara got washed away. It was a bit sad. I liked this book because the brother and the sister persevere to get the water to the hippo, so it saves its life, and now he is happy. I gave it two stars because it is too young for a six year old and would be much better for a four year old. Because this story is telling you should help each others. I liked this story becasue I learnt "if you are nice to nature, nature will be nice to you".